La Galette, on Corkhill Drive, Tilba Tilba. Photo: Lisa Herbert. In the last chapter of our coffee stop tour of South East NSW, for now, we take in the brilliant aqua-blue waters of Narooma and the magic of the Tilbas. And as always I am looking for that ‘bit on the side’ that adds something unique to my (and your) experience. Light, bright with a patio perched over a stunning view, the service here is attentive and efficient. There is something very special about the waters of Narooma – the colour? The clarity? The bounty? And you could stare seawards over a well-made latte here for hours, or invite girlfriends for a luscious and relaxing lunch, or even tapas on Friday or Saturday night. My latte is strong, well made with deep caramel notes. The menu is extensive and meals being delivered around me look excellent. My granola with berries is fresh and comes with a rare sighting of regional twist – local orange. Tilba Milk, Honorbread, Wild Rye’s products and Narooma seafood, a showcase of local bounty! The View, Narooma. A spectacular view over calm waters and breakwaters. Photo: Lisa Herbert. Address: Shop 6/4/6 Narooma Cres. 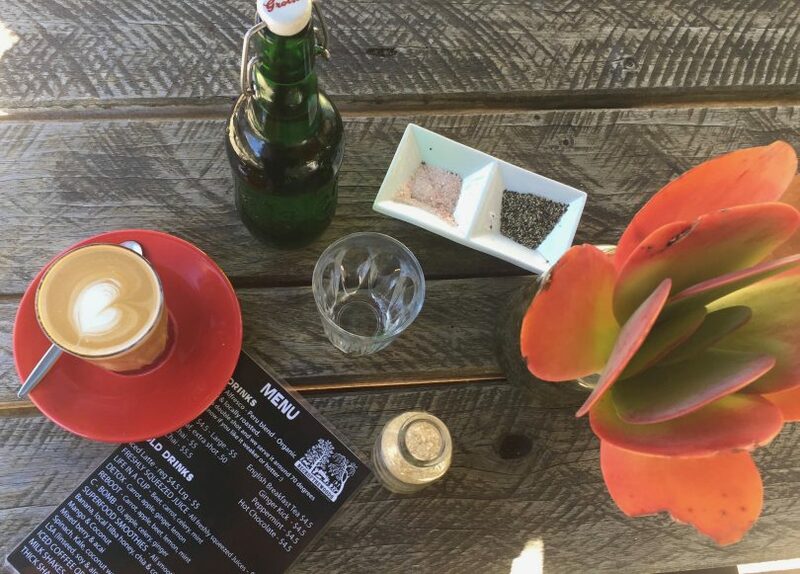 Very welcoming, an air of local sustainability, rustic furnishing, and delicious coffee from Moruya’s Alfresco, Bound to Earth definitely has the early morning seaside coffee vibe going on. A small daily menu of mainly Honorbread goodies, some house-made buckwheat banana bread, and cheese panini. But the point here seems to be enjoying excellent coffee and some lively conversation. My coffee with soy was absolutely delicious, very creamy and strong, so I lingered. A very mindful little enterprise. Bound to Earth, Tilba. Very welcoming, with an air of local sustainability. Photo: Lisa Herbert. Central Tilba is a heritage village that seems perfectly preserved, as if in aspic. Embraced by Gulaga Mountain and perfect green scenery, the main street is a stroll through time. The Tilba Teapot is filled with antiques, teapot vases, paintings, old signs and flowers. Country-style, home-made food is overflowing from cabinets, like sausage rolls that look like something from a dream I once had, and huge meringue muffins, cakes and crusty pies. A big chalkboard menu takes up a wall in the side room. The kitchen is open so the sounds and smells are part of the experience. I’ve had many breakfasts here and they are always good. 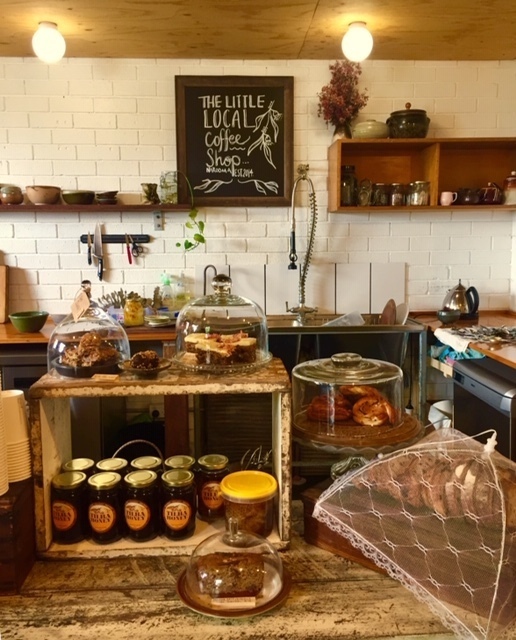 Coffee is locally roasted by Montague’s (best coffee to be had at the Moruya Market by the way), and service is friendly. The whole experience is very photographable – abundant and old-world. 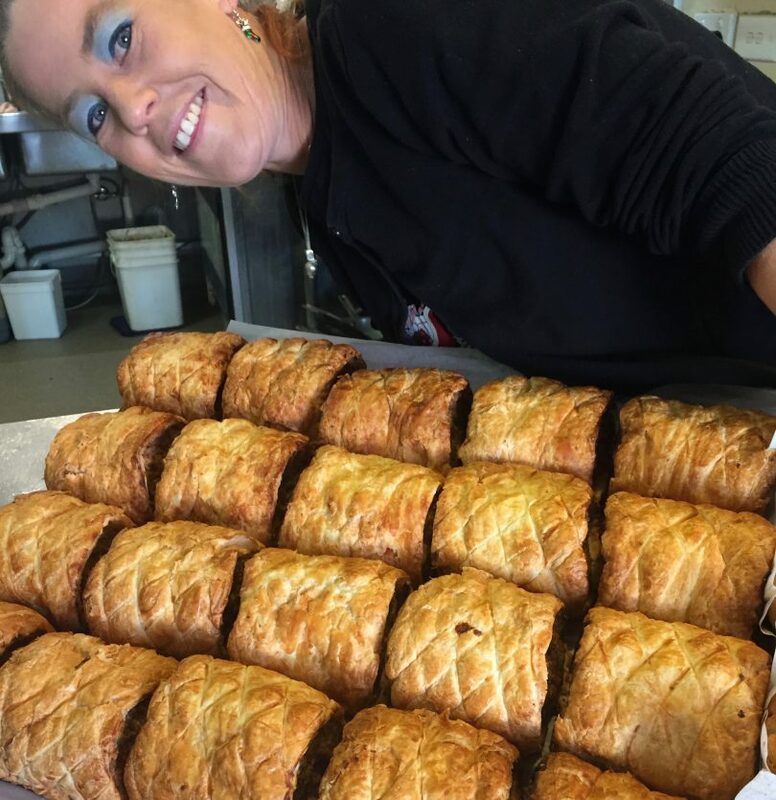 “Sausage rolls that look like something from a dream I once had.” The Tilba Teapot. Photo: Lisa Herbert. A more contemporary looking establishment compared to most of Tilba’s main street, and fully licensed, ‘Woods’ offers coffee and breakfast and lunch until 3, then re-opens for pizza on the deck, which I’m told tends to book out. Coffee on the expansive deck under Tilba trees is warm, sunny and relaxing. 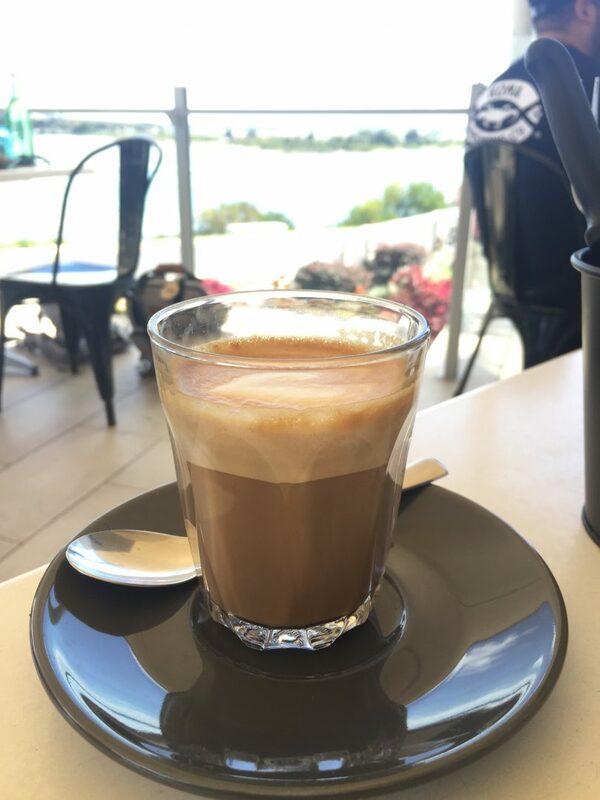 I’m a fan of Alfresco Roasters, and my latte was perfectly made, the barista keen to let me know her product was organic – I do love a passionate barista. There are some good breakfast options, and great lunch choices such as a Burrito, tomato and feta Bruschetta, and toasted sourdough sandwiches, including the Woods Cuban, and a San Sebastian. I do admire a well-constructed egg and bacon roll, and the ‘Woods’, with beetroot, onion, Tilba Swiss cheese, homemade tomato relish and rocket is a winner. A more contemporary looking establishment compared to most of Tilba’s main street – Neck of the Woods. Photo: Lisa Herbert. A Galette is a buckwheat flour savoury crepe, traditionally made in Brittany, France. A Madeleine is a small and shell-shaped cake, with a very literary reputation, traditionally from Lorraine. They are all here at La Galetta in the Tilbas. 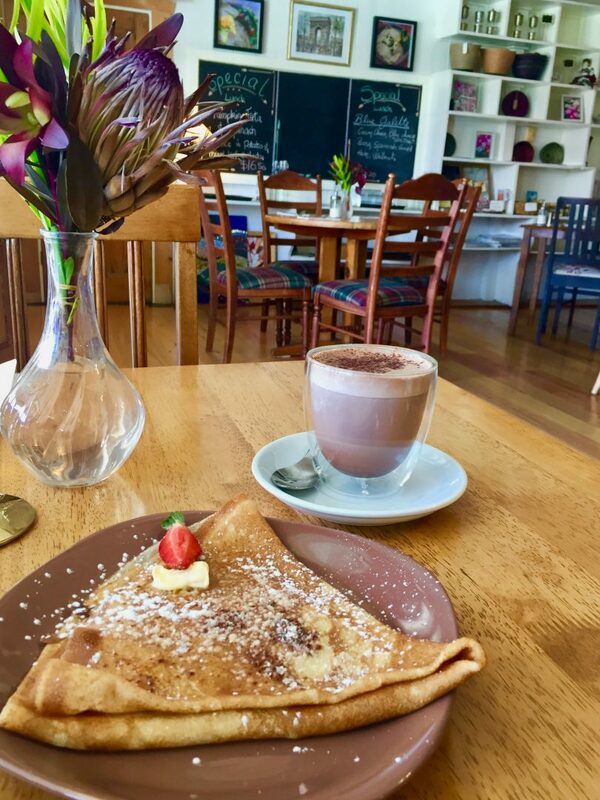 Chequered table-cloths, country chairs, slow turning fans, wooden floors, French doors and freshly cut flowers – La Galette is a welcome addition to the scene in Tilba Tilba, just down the road from Central Tilba’s busy main street. Lovely, welcoming service, and yes, they are French. 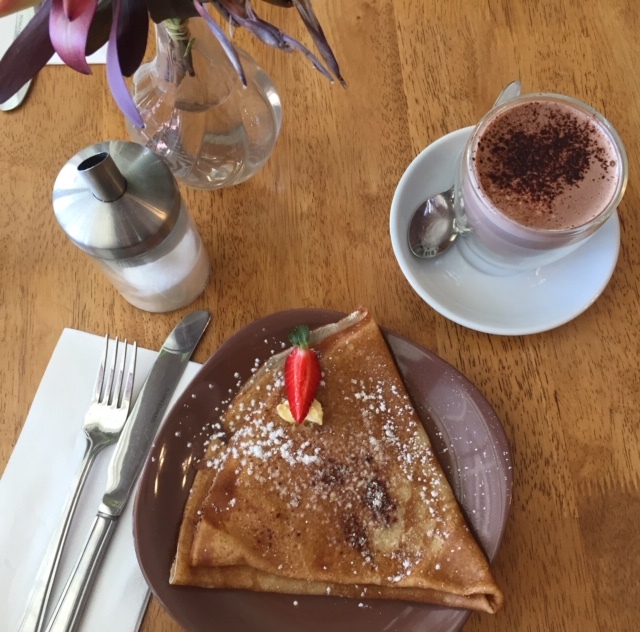 Delicious coffee and hot chocolate, and our crepe is certainly a light and delicate way to satisfy a sweet craving. And these crepes are quite inexpensive so why not have two? Lemon and Sugar, Lemon and Honey, Cinnamon and Sugar, Nutella, Jam, or Banana an Chocolate. There are also Welsh Cakes, a big breakfast and wait for it…French Toast. Ratatouille and bechamel also appear on the lunch menu, enrobed in the very light and delicious Galette. A lovely verandah sits over the front street, where you can wave to people going past, as you do around here. “Our crepe is certainly a light and delicate way to satisfy a sweet craving.” Tilbas’ La Galette. Photo: Lisa Herbert. Did we miss your fave café? Give it a shout out in the comments below. Editors note: Lisa Herbert dined at her own expense. Reviews are honest and not based on a commercial relationship. You missed the most fantastic coffee place of all. Montague in Narooma where you can sit on the street and talk with friends and tourists passing by, or go into the courtyard where your dog is also welcome, or sit inside and choose a table and chairs or a relaxing couch with coffee table. The coffee is roasted in house and is that which you bought at the Moruya market. The beans are also for sale here. If you want something to eat with your coffee you have a choice of a range of cakes and muffins or house made fresh sandwiches. The coffee is just the best and the young women who work behind the counter are friendly and happy. Closed Sundays. Montague Coffee Narooma has fabulous coffee, all coffee beans are roasted on the premises.